Helen Mirren took home the Academy Award in 2006 for her portrayal of Queen Elizabeth II in Peter Morgan’s film The Queen, so it was perhaps a bit of a surprise that her reprisal of the role was announced to take place on the stage of the Gielgud Theatre in The Audience, a new play written by Morgan and directed by Stephen Daldry. 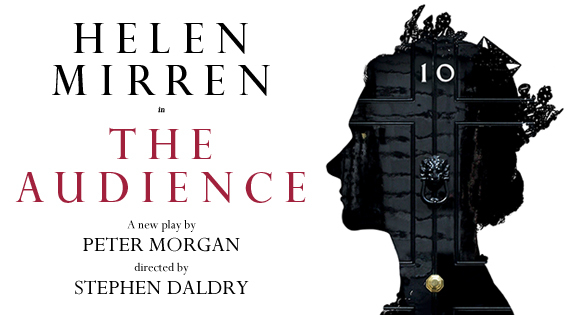 The Audience centres on the custom for the reigning monarch to meet their Prime Minister every week at Buckingham Palace, a meeting which is held in complete privacy, and it is this that Morgan has seized upon. The play has just started previews and opens officially on 5th March. He imagines how some of these audiences might have gone, with strong political characters and epochal events of the second half of the twentieth century passing through and the Queen being the only constant, though not unchanging. There have been 12 Prime Ministers during the Queen’s reign so far, 8 are featured here and even some of those are just fleeting appearances. But Morgan’s selectiveness and use of a non-chronological ordering pays huge dividends in the development of the play and of the Queen as a dramatic character. The fluidity of the timeline has an elegant dynamism and allows the growth of HM’s confidence as a statesperson to be portrayed in a fascinating way, able to dip back and forth to show how lessons were learned in the past and how they refracted through her future. Morgan also uses a young Princess Elizabeth intermittently to show the personal growth of the woman beneath the crown, the conversations between the older and younger selves showing the strength of her personality traits with an understated humour and emotion. Mirren is superb throughout, never off-stage for more than seconds and frequently remaining onstage to go through the costume and hair changes that mark the shifts in time. But what is truly remarkable is the way in which her performance modulates subtly each time, both physically and vocally as she offers a potential insight to the internal workings of a sovereign. From the stiffness of a young Queen still in mourning, to the glorious regality of her forcing admission of collusion in the Suez affair, to a more circumspect but no less majestic bearing as the 86 year old she is today, Mirren really is nothing less than mesmerising. The audiences themselves are also really well structured, managing to combine several elements in one. The encapsulation of a Prime Ministerial reign in a single conversation, capturing the contrasting personal relationships between them all – the array of social gaffes as they all try to figure out just how familiar they are allowed to be is simply hilarious and of course, the eloquent positioning of the Queen’s interventions or reactions to the matter at hand. And though this is clearly Mirren’s show, there is some genuinely outstanding and transformative work from some excellent character actors as her PMs. There’s a titanic battle of steely wills as Haydn Gwynne’s Thatcher coldly rages against the breaking of convention in the monarch passing public judgement on the PM which is countered beautifully by a rare expression of heartfelt emotion which Mirren delivers with pinpoint accuracy. Paul Ritter’s excellent bumbling as an apologetic John Major is one of the funnier pairings, which sets the stage well for the explosive reaction to the demise of Britannia and Robert Hardy’s ailing and officious Churchill is the perfect foil to the young Queen-elect as she tries to observe her innate sense of duty and the centuries of tradition yet be the best wife and mother she can. But it is with Richard McCabe’s extraordinary performance as Harold Wilson that the show really finds its heart as over a number of encounters, this most unlikely of relationships deepens into something that becomes infinitely moving. These scenes really capture the essence of the show, gently suggesting an emotional development for its lead character that feels plausible yet respectful and provides a hugely satisfying final note. A more cynical view might see The Audience as an opportunistic jump on the coat-tails of the Jubilee feel-good times, but that would be an absolute disservice to this play which is frequently genuinely funny (and up-to-the-minute topical in its humour), seamlessly directed by Stephen Daldry in Bob Crowley’s elegant designed set with its smooth transitions and impeccably acted, not just by Mirren but by its whole company. Entertaining and enlightening, this is bound to be one of the most successful plays of the year – book now while you still can. Note: we sat in the dress circle slips, A3+4 and they were really good seats, close to the stage, view hardly restricted and rather bargainous in the grand scheme of prices for this show. Still some available via their website.